The Philippines is surrounded by gorgeous beaches, so it's no surprise that some of the biggest celebrities choose to tie the knot at the prettiest locations around the country. 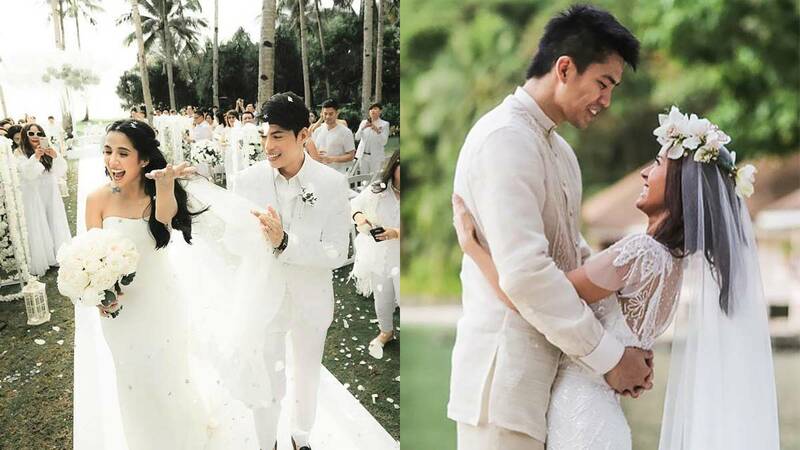 Whether you prefer a low-key celebration or a grandiose affair, take some wedding inspo from some of our favorite Pinoy celeb couples! What makes a wedding even more romantic? A sunset, of course! Drew Arellano and Iya Villania (whom we hear are already on Baby Number Two!) took advantage of Nasugbu’s epic sunset with a cliffside wedding atop Meditation Point in Kawayan Cove. Their star-studded guest list was treated to a spectacular view of the ocean, while their swoon-worthy vows were perfectly timed to catch the golden hour. Think of the best beach in the Philippines and Boracay will surely be on top of the list. To show off their shared love for surfing and the sea, Jericho Rosales and Kim Jones exchanged vows at Shangri-La's Boracay Resort & Spa to an intimate crowd of friends and family. In a previous interview with Preview, Kim shared that she "wanted to prioritize the guests" so the couple even hosted some beach-side games and gave them "little notepads and stamped giveaways." If you thought Heart Evangelista's Grace Kelly-inspired dress was stunning, you should take a gander at their wedding location! The elegant all-white venue made Balesin Island's bright blue ocean stand out even more, and we still couldn't get enough of the White Wisteria flowers hanging above the aisle. Talk about breathtaking! Jun Sunga and Vanessa Matsunaga's 2010 nuptials is the definition of the best of both worlds, with a lush garden ceremony that boasts a spectacular view of the Bellarocca's ocean. Their picture-perfect wedding had the prettiest details too, with flowers that lined the grassy aisle, beach-themed giveaways for all the guests, and paper lanterns hanging over the newlyweds. If you're all about a relaxed and laid-back wedding, take your cue from JC Intal and Bianca Gonzalez. Their surprise wedding was so intimate that only 35 guests were in attendance! The couple exchanged vows in the middle of paradise itself: El Nido, Palawan. They capped off their quaint outdoor ceremony with a small candlelit reception by the beach. Maggie Wilson's 2011 nuptials is proof that you can still have a gorgeous wedding even if you encounter some bumps along the way. She and Victor Consunji initially had plans to wed by the beach but on their big day, they were told that they needed to get married inside the church first. So they had a quick ceremony indoors then proceeded to the beach. Just as they began reciting their vows, the wedding was interrupted by a torrential rain—but that didn't stop the couple from declaring their love in front of their friends and family. Aww! Shangri-La Boracay makes a second appearance on this list because Rob Mananquil and Maxene Magalona's wedding is just too lovely to miss! Their elegant all-white ceremony took place right by the shore and palm trees, but the most heartwarming part was the bride’s walk down the aisle. Maxene carried a bouquet that had a photo of her late father, Francis Magalona, and even played his song, "Girl Be Mine."